I'm posting this photo as part of Carmi's "Thematic Photographic" project. The theme this week is glass. At the time this was taken, I was taking a picture a day for my 365 project (now my Might-Reach-365 project). I hadn't taken a picture yet on this day and desperately looked around for something to use. 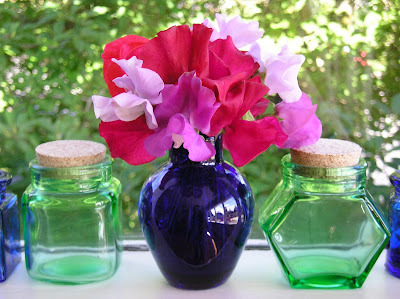 I snipped some sweetpeas from my garden and lined up these jars on the windowsill. I definitely like this photo! I think it needs to be added to our joint on-line flower album. Don't forget to do that, okay? In all your spare time? I love the colors and shapes you've captured in this photo, Susan. It's scenes like this that make me glad I got into photography...I feel as if I've had my eyes massaged! Spring has sprung! This is a very "happy" scene. The lighting and composition are engaging. Thank you for sharing!